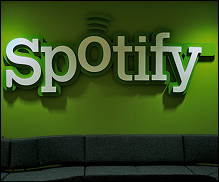 STOCKHOLM, Sweden (Hypebot) – Spotify has raised another $250 million in a new funding round led by Silicon Valley firm Technology Crossover Ventures. Investors are now placing the valuation of the music streamer somewhere "north" of $4 billion, multiple sources familiar with the deal tell the Wall Street Journal. Previous Spotify funding rounds from 2008-2012 total $288 million, with Goldman Sachs and Klein Perkins in for $100 million each. At $4 billion, Spotify's valuation is nearing Pandora's public market capitalization, according to the WSJ. Pandora, which reports fourth-quarter earnings this afternoon, is valued at about $5.7 billion. The new funds will be used to fuel global growth in the increasingly competitive streaming music market. Just today Deezer, Spotify's closest competitor in Europe, confirmed that it will enter the U.S. market in 2014.